Today is a glorious day – there’s real warmth in the sun and the sky is a wonderful shade of blue, with just a few white fluffy clouds dotted here and there – it’s hard to believe that we’re in mid-November and Christmas is just around the corner. Ben is snoozing outside in the courtyard, and as soon as I’ve finished this post I’m off to take him for a walk through the woods behind our village. It’s at this time of year that I become more aware of the animals around us – deer and fox tracks are visible in the mud (yes, the mud has returned! ), and often I glimpse a flash of movement in the corner of one eye as a rabbit or pheasant makes good its escape into the undergrowth. I was thrilled to see two large brown hares chasing across a field of stubble when I last dropped Ben at his favourite kennels a couple of weeks ago – I don’t see hares close up very often. One animal that is regarded with very mixed feelings in our village is the fox. Clever, crafty – and the sworn enemy of chicken-keepers everywhere! 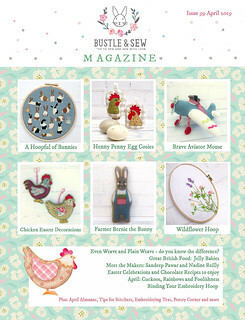 But undeniably a very handsome fellow who features in the first pattern for the December issue of my Bustle & Sew e-zine. 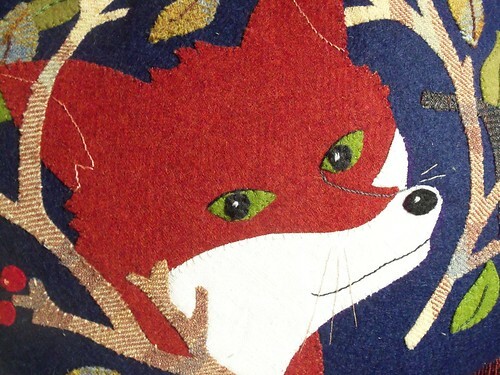 I’ve tried to reflect his cunning and curious nature in my applique – I didn’t want him to be too cute – and I hope I’ve managed to achieve the right balance. 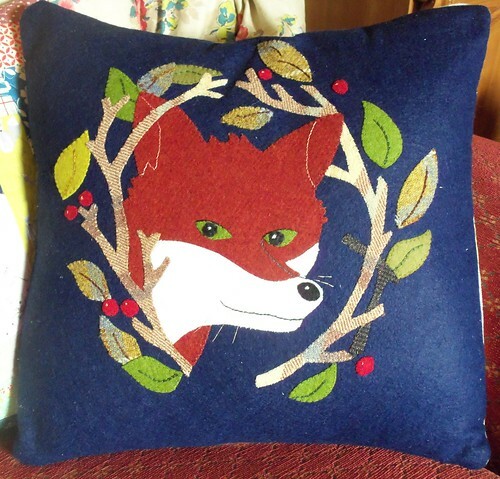 He’s appliqued in felt and wool on a wool-blend felt background and here I’ve chosen to make him into a cushion cover. When we lived in Hampshire many years ago (when Rosie was a very little girl), a hedgehog used to visit our garden from time to time. I don’t see many hedgehogs here, apart from my very own Hodge and Podge – and I don’t really know why that should be as we have so much other wildlife around us. …. 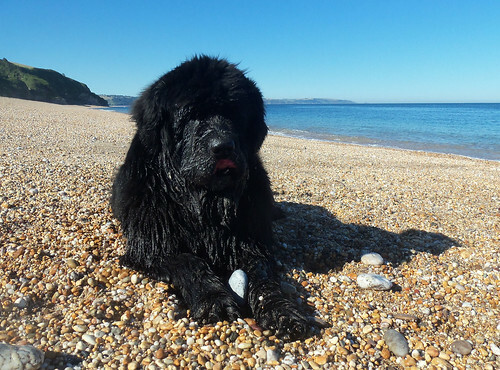 a smooth, round beach pebble carefully selected by my canine assistant for its shape, size and general overall appeal! (well, it’s about time he did something useful.) 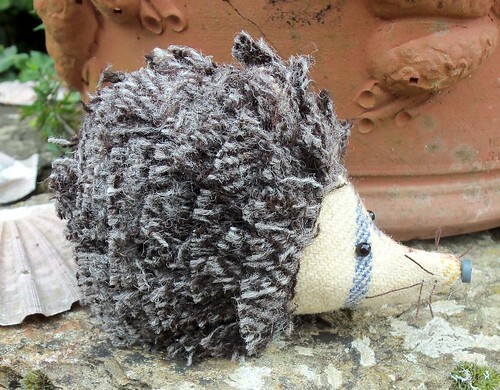 If you’d like a Podge kit, then you will find them in my Etsy shop – just the two at the moment sorry both sold , as I don’t know if I have any more suitable fabric for her prickles – if these two sell out, then I’ll have a rummage around my cupboard! PS the pebble was washed before it was added to the kit! You’re right, it’s a perfect autumn day. Ruby’s snoozing in a shaft of sunlight in the lounge, unfortunately it keeps moving and she has to keep moving. It’s a tough life for a dog! I like the look of the fox. Everyone’s getting cushions for their birthdays next year, so this is another pattern to remember. Oh my goodness! You are such an incredible artist! That fox is amazing! I love your fox! A handsome fellow indeed! And another reason to look forward to the next issue of your e-zine…! It has indeed been a beautiful day today, Max (our dog) and I had a lovely walk in Epping Forrest this morning and he has spent the rest of the day snoozing in the sunshine. I love the fox and I think you hit him spot on. 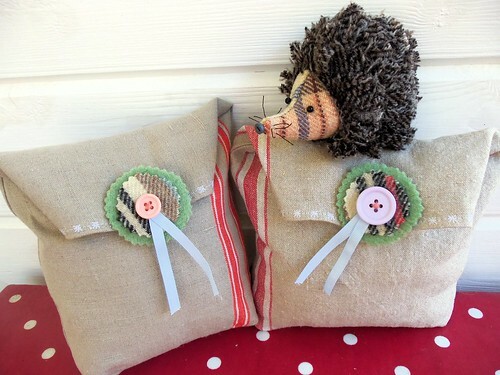 I did pop over to you Esty Shop and I bought 1 of your little Podge Kits. I couldn’t resist her, and your lovely vintage fabrics!! Thank you Helen, and I am looking forward to the Dec. ezine as always! 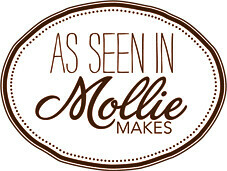 Hi Jan, thanks for your purchase, I’ll post your kit tomorrow – hope you like it! Hi Maribel, the pebble is positioned in the base so Podge sits nice and steady.